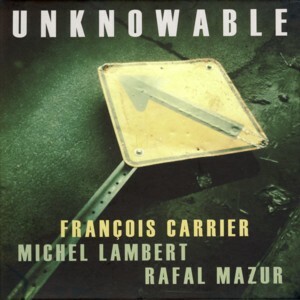 This is a live recording by the Improvised Music trio consisting of Canadian saxophonist Francois CarrierFind albums by this artist and drummer Michel LambertFind albums by this artist and Polish acoustic bass guitarist Rafal MazurFind albums by this artist. The trio performs six spontaneously improvised pieces, credited to all three trio members. The music was recorded at the Alchemia Jazz Club in Krakow. Although improvised, the music is characterized by a high degree of melodic content as a result of Carrier´s contributions, which are mostly long lines of melodic themes. Mazur´s bass guitar is always very melodic and here it harmonizes perfectly with Carrier´s leading lines. Lambert is a very delicate and sympathetic drummer, supporting his cohorts with his dense, precise rhythmic patterns, but keeping the volume well in control in order not to dominate the proceedings.